Enter for a chance to win a $50 gift card by signing up with your email address to receive news and updates. Click below to send someone a samich or craft beer! Indiana Pennsylvania's Best Restaurant and Bar. We serve the best burgers, samiches, salads, wings, hoagies, and milkshakes. We are also IUP's Craft Beer Headquarters. Thick Soft Pretzel sticks deep fried to a golden brown served with a Jalapeño Cheese Sauce. Nacho cheese, chili, jalapeños, and black olives. Served with a side of salsa and sour cream. Add Grilled Chicken, Steak, or Pulled Pork. Mini pulled pork sandwiches topped with mozzarella cheese. Potato skins topped with pulled pork, shredded mozzarella, & cinnamon sugared bacon. Served with Ranch. Kabobs with Kielbasa, Mini Pierogies, Onions, & Peppers. Served with Bold Gold Sauce. Spinach Dip served with a grilled pita points. Premium chicken tenders served on a bed of fresh cut fries. White meat chicken, monterey jack, cheddar, & jalapeño peppers, stuffed into crunchy corn tortillas. Served with Ranch. Your choice of fried popcorn or jumbo shrimp. Served with a lemon wedge and house-made Po’Boy dipping sauce. Breaded pickle spears. They are “Dill”icious. Served with Ranch. Battered onions. Served with one dipping sauce. Breaded provolone sticks. Served with marinara sauce. Potato & cheddar pierogies sautéed in butter with onions. Served with sour cream. Our fresh cut fries topped with secret blend of seasonings. Served with white american cheese sauce on the side. If you're from Philly you already know how good these are. Our fresh cut fries topped with one wing sauce of your choice, shredded mozzarella. Served with Ranch. Our fresh cut fries topped with chopped bacon, one wing sauce of your choice, shredded mozzarella. Served with Ranch. Our award winning spicy chili, topped with shredded cheddar cheese. Onions by request. Tomato Bisque available everyday. Also ask your server what the soup of the day is. Try these Pittsburgh style samiches suggested by our customers and perfected by our chefs. They are piled high with fresh cut fries, slaw, and tomatoes. Onions by request. Spicy chicks breast, corned beef, provolone cheese, and egg. Spicy chicks breast, capicola, provolone cheese, and egg. Chicks breast, Virginia baked ham, swiss cheese, and egg. Philly cheesesteak meat, cheese sauce, and egg. Pastrami, corned beef, provolone cheese, and egg. Fried kielbasa, bacon, american cheese, and egg. Turkey, Virginia baked ham, bacon, provolone cheese and egg. Grilled hot sausage, salami, provolone cheese, and egg. Virginia baked ham, bacon, cheese sauce, and egg. Roast Beef, bacon, ranch dressing, american cheese and egg. Virginia baked ham, swiss cheese, grilled pineapples, sweet BBQ sauce, and egg. Chipotle black bean burger & provolone cheese. Pulled pork with our house made Disobedient Spirits Hickory Whiskey BBQ sauce & provolone. Pulled pork with our house made Disobedient Spirits Hickory Whiskey BBQ sauce, hot sausage, bacon, provolone cheese & egg. Natural Beef burger, bacon, american cheese, & egg. Beer battered cod & american cheese. Filet tips, peppers, onions, white american cheese sauce & egg. Virginia baked ham, capicola, salami, pepperoni, italian dressing, provolone cheese & egg. All samiches are Pittsburgh style and come served on fresh thick-sliced italian bread, include cheese & are piled high with fresh cut fries, slaw, and tomatoes. Onions by request. Choose one from below. All wings include celery & one bleu cheese or ranch per 6 wings. First wing sauce complimentary. All served with a side of our fresh cut fries. Onions & Pickles by request. Substitute Crispy or Grilled Chicken for free. Substitute our Chipotle Black Bean Burger for any burger for FREE. 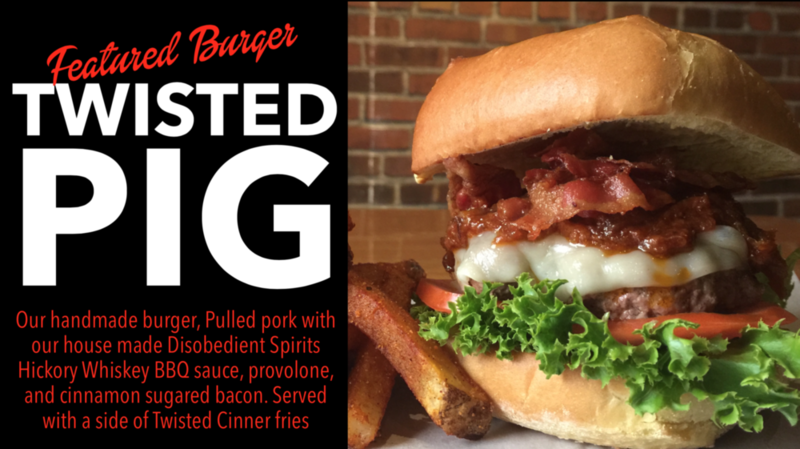 Our handmade burger, Pulled pork with our house made Disobedient Spirits Hickory Whiskey BBQ sauce, provolone, and cinnamon sugared bacon. Served on a brioche bun with a side of Twisted Cinner fries. You’ll need a steel chin to finish this gigantic burger. Twelve ounces of burger topped with Bacon, American Cheese, Lettuce & Tomato. All squished between two grilled cheese samiches. Natural beef burger with american cheese, onion rings, sweet BBQ sauce, bacon strips, lettuce and tomato. Natural beef burger with bleu cheese, bacon strips, lettuce and tomato. Chipotle black bean burger, american cheese, lettuce and tomato. Natural Beef burger with swiss cheese, Virginia baked ham, slices of grilled pineapple, sweet BBQ sauce, lettuce and tomato. Served with a side of onion rings. Natural beef burger with swiss cheese, mushrooms, lettuce and tomato. All served with a side of our fresh cut fries. Beef or Chicken cheesesteak with provolone cheese or cheese sauce, onions, peppers, lettuce and tomatoes. Ham, pepperoni, salami, with provolone cheese, lettuce, tomatoes. Served with a side of italian dressing. Popcorn shrimp, red onions, slaw, tomatoes, topped with house made Po’Boy sauce . Served on a hoagie roll with a side of our fresh cut fries. Freshly grilled broccoli and cauliflower, bell peppers, carrots, onions and mushrooms cooked in our balsamic vinaigrette and topped with provolone cheese. Crispy buffalo boneless wings, iceberg lettuce, tomatoes, red onions, green peppers, olives, croutons, shredded cheddar, and topped with fresh cut fries. Fillet tips, iceberg lettuce, tomatoes, red onions, green peppers, olives, croutons, shredded cheddar, and topped with fresh cut fries. Grilled chicken, iceberg lettuce, tomatoes, red onions, green peppers, olives, croutons, shredded cheddar, and topped with fresh cut fries. Cajun seasoned filet tips, iceberg lettuce, tomatoes, red onions, green peppers, croutons, hard boiled egg, bleu cheese crumbles and topped with beer battered onion rings. Our famous chili, iceberg lettuce, tomatoes, red onions, green peppers, olives, shredded cheddar, sour cream, and topped with tortilla strips and chips. Iceberg lettuce, tomatoes, red onions, green peppers, olives, croutons, & shredded cheddar. Crispy buffalo chicken breast with provolone cheese, lettuce and tomato. Served with a side of ranch or bleu cheese. Crispy chicken breast with provolone cheese and marinara sauce. Crispy chicken breast, bacon strips with swiss cheese. Served with Ranch. Grilled cheese sandwich served on thick italian bread with a bowl of tomato bisque for your dipping pleasure. Filet tips, sautéed onions, provolone cheese, garlic mayo. Beer battered with american cheese, tartar sauce on the side. Served with a side of slaw. Pulled pork with our house made Disobedient Spirits Hickory Whiskey BBQ sauce, and shredded mozzarella cheese. Served with a side of slaw. Clique Vodka & Watermelon Pucker. Our Best Selling Signature Cocktail. Yeah its so good that I named the bar after it. Absolut Raspberri. This is so good that it will having you blowing raspberries. Please swallow your drink first though. Angel’s Envy Bourbon & Disaronno. If you like bourbon then you need to try this drink. Random Fact: Jimmy’s favorite movie is The Godfather. Avion Tequila. Our take on a margarita. You don’t have to worry about finding any worms in your drink, Jimmy loves them so he ate them already. Irishman Whiskey, Peach Schnapps, & Sierra Mist. This will remind you of those nights sitting on the porch sipping on fresh tea. WARNING: You may get the urge to take off your shirt and give it to someone. American Harvest Vodka, Death’s Door Gin, Bacardi, Cointreau & Pepsi. Our take on a Long Island. When George Washington landed on Herr’s Island this was the first thing he drank. It’s a fact, google it. The Irishman Irish Cream, Kahlua & Root Beer. Our Best Selling Signature Drink will make you feel like you can throw a no-hopper from the warning track to home plate. HELPS US IMPROVE & GET REGISTERED TO WIN SOME CASH AT THE SAME TIME! Want to know our specials or promotions? Click any of the icons below to stay up to date on our social media sites. What if the pending charge on my bank account doesn't match my signed credit card receipt? The pending charges will often differ from the amount that will go through as an actual charge on your account. We ask that you please allow 4 to 5 days for credit cards charges to clear pending status before making an inquiry about charges. Email cards@samiches.com if an issue remains after charges clear.